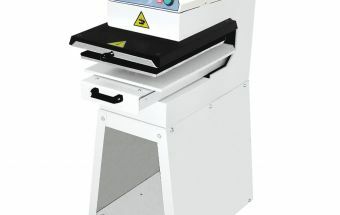 The PES 300- SEMI-AUTOMATIC HEAT PRESS is a semi-automatic printing machine developed for applying high and low-relief effects (embossing). Being easy to handle, this heat press can be easily prepared for several functions, and allows for arranging prints up to an area of 400 x 500mm. This model allows for the removal of the cliché-holder (typical for embossing processes) and use the press with several other types of transfers. The pressing operation is facilitated thanks to its pneumatic system that makes the work much more practical and causes less fatigue to the operator.